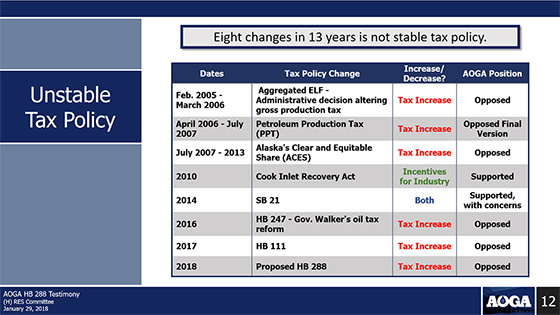 Just as Alaska begins to see signs of economic recovery, Representatives Geran Tarr, Andy Josephson and Paul Seaton have once again proposed another tax increase on the oil industry. The legislation, House Bill 288, would raise the minimum production tax rate from 4 to 7 percent, a 75 percent increase, and would be the eighth change to tax policy in 13 years. It is a terrible mistake to raise taxes now. After three years of low oil prices and recession, industry job losses are stabilizing, activity on the North Slope is picking up again, the price of oil is above $70 per barrel, and above all, oil and gas companies and Alaskans are becoming more optimistic about the future of Alaska’s most important industry. 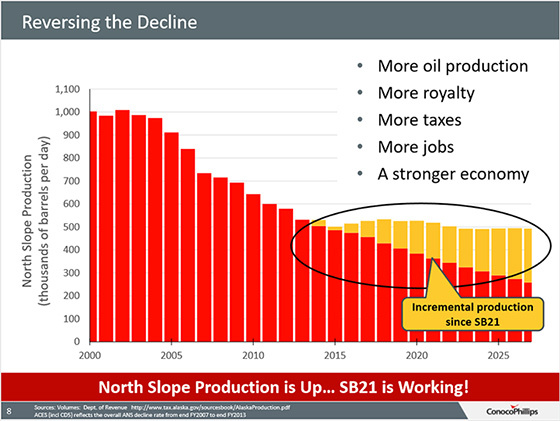 "The bill will stall the growing momentum in the industry that has and continues to drive Alaska's economy," said Cory Quarles, Alaska production manager for ExxonMobil. HB 288 is in House Resources, co-chaired by Josephson and Tarr, which has already held three hearings on the bill. Make a difference and contact your representative and state senator. Respectfully ask her or him to oppose a bill that threatens to chill investment and the new jobs and revenue that come with it. On another front, the Legislative Oil and Gas Working Group will continue to meet throughout the 2018 legislative session. This joint committee was established from the latest tax change contained in HB 111, passed last summer by the legislature. It is tasked with examining the existing petroleum tax regime and making recommendations in the form of a report to the entire legislature. KEEP will keep you apprised of the committee’s activities throughout the session. While there are storm clouds hovering over Juneau, several recent developments on the North Slope and in the nation’s capital are raising the level of attention given to Alaska and its world-class hydrocarbon resources. BP reports the oil production decline at Prudhoe Bay has been halted for the third year in a row. Production averaged 280,000 barrels per day in 2017, compared to 281,700 barrels in 2016 and 281,800 barrels in 2015. How significant are those numbers? Just a few short years ago, production at Prudhoe Bay was falling by about 5 percent a year. Want more proof our oil industry is rebounding? Check out the amount of oil flowing in the trans-Alaska oil pipeline. 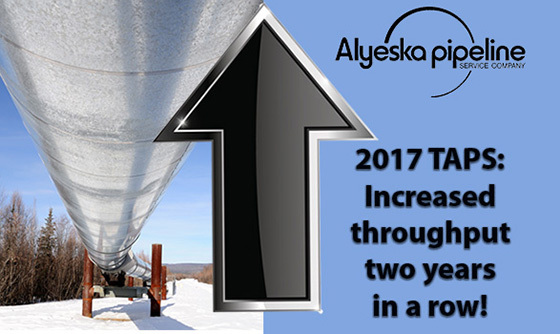 Alyeska Pipeline Service Company says throughput averaged 527,323 barrels per day, an increase 1.5 percent over the previous year. On the exploration side, the news keeps getting better. Leases are getting snapped up and exploratory drilling is yielding some very interesting results. Armstrong Oil says its Nanushuk field could hold up to 3 billion barrels of oil and other companies are reporting significant discoveries that could also yield billions of barrels of new oil. The lesson here is simple. Predictability pays off. Meanwhile, monumental changes to national energy policy, changes Alaskans have patiently waited decades for, are now taking place. Congress opened the Arctic National Wildlife Refuge to safe, environmentally-responsible leasing and exploration last December. The 2,000-acre, non-wilderness 1002 Area, specifically set aside for oil leasing and exploration, could be the largest untapped onshore oil reservoir in North America. How much is there? Only drilling will tell – but the chances of finding a commercially developable deposit are good and that would mean billions of dollars in new revenue, new jobs and new economic growth, not to mention extending the life of the pipeline by decades. And it gets better. The U.S. Department of the Interior just placed nearly all federal waters off Alaska up for lease sales. The Bureau of Ocean Energy Management’s draft 2019-2024 National Outer Continental Shelf Oil and Gas Leasing Program will offer a total of 19 lease sales. Our congressional delegation has asked the Interior department to limit the lease sale to three basins, Cook Inlet and the Beaufort and Chukchi Seas. Looking to the horizon, the Interior department also released an updated assessment of Alaska’s undiscovered and technically recoverable oil and gas reserves. Some 17.6 billion barrels of oil and 52.6 trillion cubic feet of natural gas could be lying beneath Alaska. Those estimates make the North Slope competitive with almost any oil basin in the world. KEEP thanks Interior Secretary Ryan Zinke for his leadership and vision. Alaska now has an ally in Washington, D.C., who understands and appreciates Alaska’s contribution as America’s energy storehouse. KEEP Alaska Competitive is only as strong as the Alaskans who support it. We thank you for spreading the word about stable tax policies, contacting policy makers and supporting a strong, viable economy that benefits all Alaskans. We are making a difference. Stay tuned for more news about ongoing attempts to raise oil taxes and curtail economic growth. We will also share with you the success stories coming from Alaska’s oil patch and ask for your engagement in keeping Alaska’s economy on the path to recovery.